Just like many areas where science and art intersect, there is a preponderance of theories and formulas in Music Theory. From the classic Theory that you will learn as a music major in just about any college, to the more obscure theories that you have to know to play jazz, music theory has many branches. What is unfortunate as is that the majority of how Music Theory is presented is often not useful to the performing musician. While standard Music Theory is great for passing a test or impressing a fellow music nerd, rarely does it help when the rubber meets the road. This is where “Street Theory” comes in, our term for the Music Theory we have learned over the decades in the process of actually playing music on stage and in Jam sessions. The best place to start is by learning more about chords. Why? Because chords are the “paint” that gives music it’s color, the art of combining notes to create a mood and emotion. But before we dive into the wonderful world of chords, we need to take a step back and discuss the bare bones of Music Theory, of how notes exist in space. Think of it this way: there are only two ways that a musical note can appear: either by itself, or combined with other notes. Makes sense, right? Indeed, pretty much all of Music Theory can be divided into the two camps of Melodic and Harmonic. 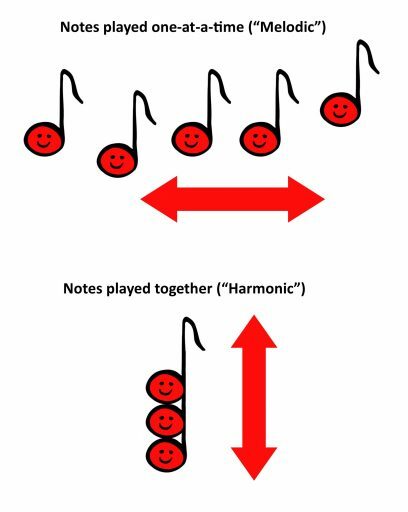 As mentioned earlier, we will start out with Harmonic Theory, as knowing how chords work is one of the most valuable skills you can have as a musician. (We will dive head first into the wild and woolly world of Melodic Theory in the next episode). OK, so we know that a chord is a combination of notes (duh), the question now is: how do you know which notes to combine? This is where we learn about the “Triad” (yes, write that down too, another important Street Theory term). The Triad is the most basic chord you can have, having just three notes. The natural laws of music dictate that you can have a chord with three or more notes, but only two notes would just be an “interval” (or Double Stop for you more folksy types). So how do we know which three notes to combine? 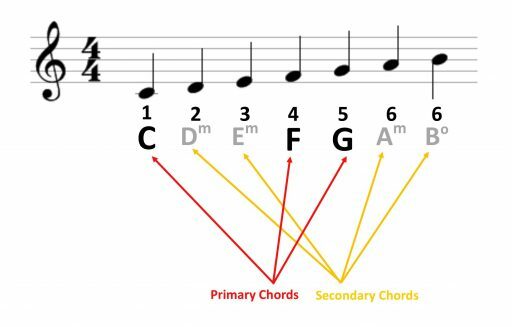 Here you go, the golden formula for chord construction: Triads are built from the 1st, 3rd and 5th degrees of a scale! Write that down and memorize it, this is true Jedi knowledge. As you can see, when we pick the 1st, 3rd and 5th notes of this scale, we end up with C, E and G, which is guess what…a C chord! And it’s the same for every key of course. 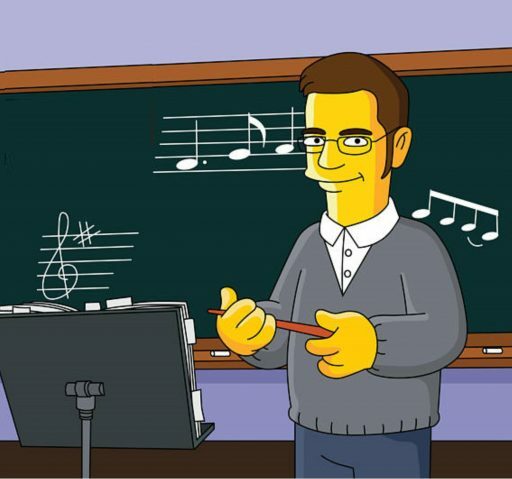 So in a G scale (G-A-B-C-D-E-F#), if we play the 1st, 3rd and 5th notes we get G-B-D (a G chord), or in a D scale (D-E-F#-G-A-B-C#) we get D-F#-A, and so on. You can see now that it would be a good idea to memorize your scales for some of the common keys, so to click HERE to get a printable chart on this (of course having them committed to memory is the best, but no rush). Now, the next Street Theory concept with chords is the difference between “Major” and Minor” chords, and what is the difference between the two. For those of you reading this with zero theory knowledge (banjo players? ), think of Major chords as the ones that sound “bright” and happy, and Minor chords as sounding more somber or sad. See what we mean? Even without knowing a smidgen of music theory you can hear the difference. Yes, those two chords are both C chords, but what actually makes them different? Easy. Remember how we build a Triad, from the 1, 3 and 5 of the scale? Now all we do is take that 3rd of our chord (the note in the middle) and “flat” it. To “flat” means to move down one half-step, so if you’re playing a fretted instrument, move the note down one fret. If you are playing a piano or keyboard, move the note down to the very next key down. On all other instruments just move the note down the next step in the chromatic scale. Got it? Good. Now let’s expand beyond individual chords, and talk about how different chords relate to each other. This is where we start making music! Think of this of in terms of painting: the Chords are the hues, both bright (major) and dark (Minor), and now the different keys (G, C, D, etc) are different colors; red, blue, green, and so on. So if we want to paint a song, we need more than one color, right? True, but we also need to know how the colors relate to each other, just like the color wheel. Here’s the skinny: Every chord has several other chords that sound good with it, and we call these chords that go well together Chord Families. And when you learn the Chord Families, you will gain musical super powers! Seriously, knowledge of the Chord Families will allow you to write your own music because you will know which chords to use together, and, you will be able to play music with others much better because you will know what chords they are likely to play! So yes, you want to learn this. OK, for each key, there are three chords that go well together and occur frequently. 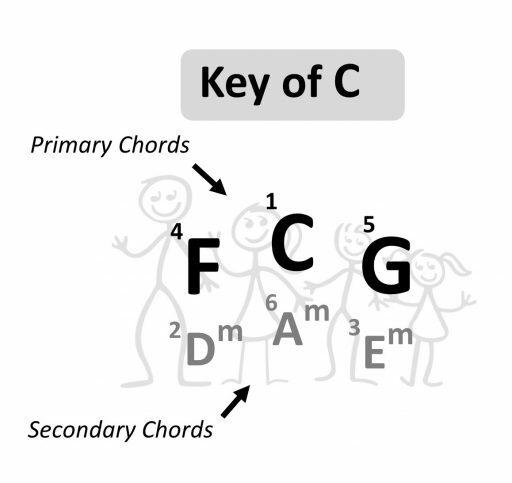 These are called the Primary Chords, and are shown in the top row in our Chord Family diagram. Then, under those are the Secondary Chords, which happen less often but are good to know. These are usually played as Minor Chords, although in more jazzy songs they can appear as Major chords too. C – F – C – G … and then play: C – Am – Dm – G … see how “right” these sound? That’s because they are all in the same family! Another cool thing about the Chord Families is the relationship with the Primary Chord and the Minor Chord right under it. Every Major chord has a Minor chord that goes really well with it, it is called the “Relative Minor”. (You can also find the Relative Minor of any chord just by counting three half-steps down, so from C we would go “B, Bb, A“, and viola, Am is our relative Minor!). Try playing back and forth from C – Am – C – Am and you’ll see how cool and hypnotic it sounds. The difference is, now we’re not referring to how to build a Triad, instead we’re organizing all of the chords in the key of C according to scale numbers. So as you can see, our Primary Chords fall on the numbers 1, 4 and 5, and the Secondary Chords are 2, 3, 6 and 7. This gives a handy way to talk about the chords in a song, without having to be in any particular key! For example if you tell someone “this song goes C, Am, and G“, that’s one thing. But if you tell them “this song goes 1, 6 and 5“, they can pretty much play that in any key. This is also extremely useful for “transposing”, when you have to move the song to another key. Now that you see how useful it is to know your Chord Families, be sure to get our chart that shows all of them HERE. All right, last but not least, we need to talk to you about these things called “Seventh Chords“. You most likely have already seen these, identifiable by the number 7 after their name. So what’s going on here?? Well luckily this one isn’t that hard to explain. 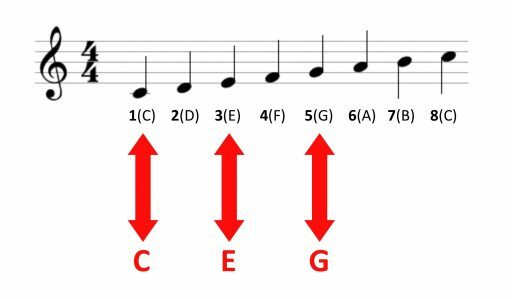 Basically all that little number 7 after the chord means is that we take the 7th note of our scale and add it into the chord. Yep, just toss it in there along with everything else, and all of a sudden the flavor of the chord changes dramatically. However there is one caveat: We have to flat the 7th note first. As you can see in the diagram below, the 7th note (B) has been flatted, so now it’s a B flat note. See what we mean? The 7th Chord definitely sounds different, and that new flavor that you are hearing is the essence of most of Blues and Rock n Roll music. It gives us that “p*ssed off, down and out, my baby done left me” sound that we need for those genres, and so you definitely want to know some of these chords. 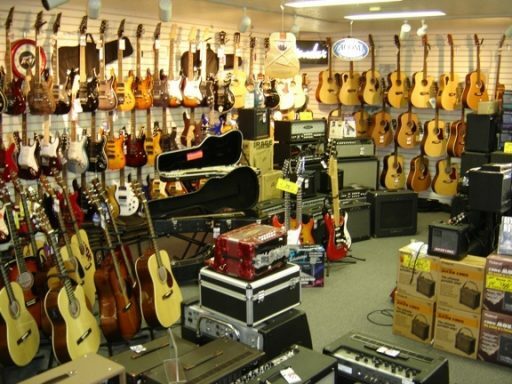 (By the way, this article is not instrument specific so we can’t offer chord charts here, however you can visit out free page HERE to get stuff for your particular ax). 10. To make a 7th Chord, just add the flatted 7th note of the scale to the chord! Well, that is enough Music Theory for anyone for now, make sure you digest this and start using it in your practice and jamming, and make sure to get ahold of us here at JamAlong for any questions you might have! Previous post: Learn to Read Music the FUN Way!